Calvin turned 8 this June and had a great birthday party with his friends. 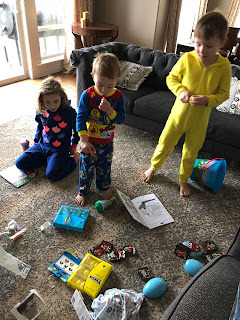 He wanted to have a Roblox party, which most kids did not have a clue what it was. It's some video game he likes to play that's getting more popular. We had a Battle Bots fight, played tag at our friends, ate lots of food, and enjoyed the day. He wanted to wait to get baptized until we had a plan with our family in Utah. He was very undecided if he should wait until we got to Utah again, or if he wanted to do it in Oregon. I was asked to attend Girls Camp this year with church and my in-laws agreed to come watch our kids while I took off for six days. Since they were in town, we decided it was the best time to do it. He's a lucky kid because he ended up getting his Aunt Jenny, Uncle Kurt, and cousins Keith and Kasen to come from Utah as well. His Uncle Phil and cousin Isaac made the trip too. 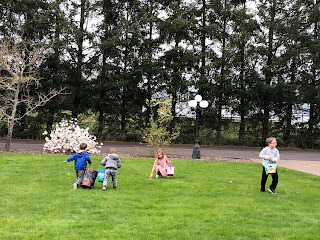 We had a house full of cousins and my kids loved it. Calvin is turning into such a fun kid. He's decided that he really likes to ride his bike. He is getting more and more brave daily. He jumps off some pretty tall things now into water after years of refusing to unless he was bribed. He is very social and always wants to play with friends and have people over to talk to. He is very tender hearted and looks out for others in a way that warms my heart completely. He is very selfless and would give away anything to make someone else happy. About the only person he argues with is his younger brother, no surprise there. Ronin loves to get his way and is used to Calvin giving him whatever he wants. But we've asked Calvin to stop giving into him and it's actually hard for Calvin to stand up for himself. I just hope he keeps great friends in his future who don't take advantage of his willingness to please others. He and Shelby are still inseparable and get along great. We are so proud of Calvin and can't wait to see more of what his future holds! I finally made it to NYC! It's been a long time waiting and I knew I was going to go someday, but this was the perfect timing, the perfect trip and the perfect friends to go with. Stacia, Britni and I have talked about New York many times together. Stacia has been but not the rest of us. Our husbands were planning to go hunting in Texas together and while they were on the high of planning their trip, we suckered them into letting us go to New York together. 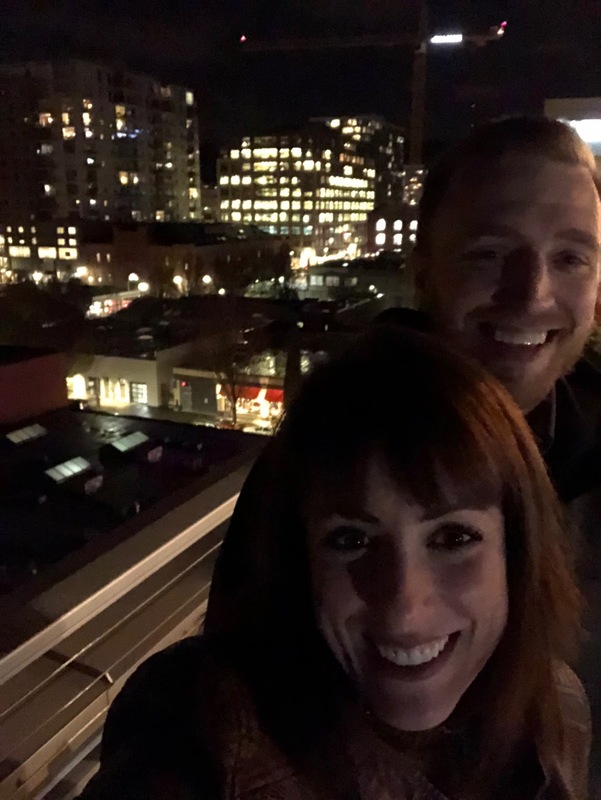 It really was a very quick decision one night when Britni got a maybe yes from her husband, the last one to commit, we booked it. I am not really one to make itineraries or travel plans but these two girls were on it. We had pre-trip meetings where Britni brought her laminated map of the city, and Stacia has about 50 notes on her phone of places she wanted to go see or eat. We were there for five days, and had about 5 weeks worth of stops to make. We flew out early in the morning on May 16 so we decided to go up to Portland on the 15th to stay at the airport. We went shopping and ate dinner and Stacia was feeling sick. She barely ate and kept saying her throat hurt. We tried to go to an urgent care but everything was closed because it was so late. We went to our hotel and we turned on a sound machine and tried to sleep. Unfortunately Stacia set her sound machine to turn off every hour. Instead of us getting up to fix it, she just kept turning it back on and every time it shut off and back on we were all awake laughing! Stacia didn't feel well and there was so much noise from cars arriving and walking around that none of us slept at all. And we had to wake up at 4 am. After a bad nights sleep we made our flight and arrived at 1 pm to our hotel. Here is our first picture in New York, with the rain, and what you can barely see is just how much luggage these girls bring! I've never seen luggage so big. I brought a backpack and one piece of luggage that went in the overhead storage. Stacia checked a bag that was as tall as she is, and Britni checked two body bags. I laughed so hard when I saw what they were bringing. Little did I know that they would use every inch of their bags and we would stuff them full of our amazing shopping finds. I talked too much smack to use their bags, I knew I dug my grave with that one. But I did manage to get Britni to check some cologne for me since it was too many ounces to take onboard anyway. First thing we did was get stuck trying to get Britni in the hotel with her huge bags. It was a circus show. We checked into our room and ordered extra blankets and towels. We were starving to death and wanted food so bad. Except for Stacia who was feeling worse and trying not to complain. So she went to an urgent care clinic and Britni and I went to dinner right by the clinic. Stacia wasn't hungry but we got her some soup and she text us when we were eating that she had tested positive for strep throat. We felt awful that we were eating some amazing corned beef pastrami sandwiches and she was back at the hotel with her meds trying to sleep. 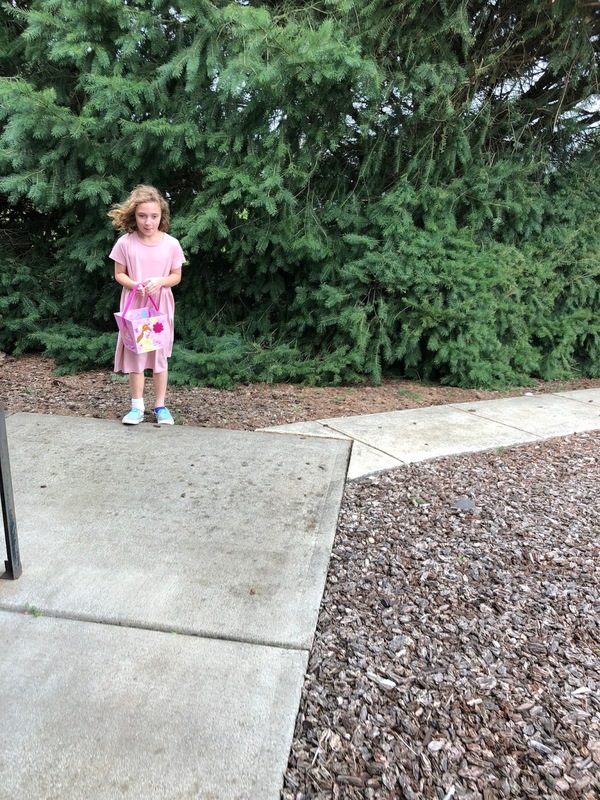 We took her the soup and she just wanted to stay inside. Britni and I hit the streets and went to city. I was dying to get outside and figure out where we were and see everything. The city really does come alive at night. It's so bright that it feels like day and there were people everywhere. We walked all over and went shopping and just looked around until it was late. 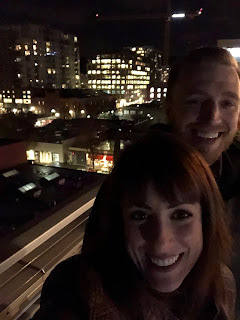 We went back to the hotel around midnight because we knew we had to wake up early but I think we could have stayed out much longer even going on no sleep and jet lag. The time change was in our favor for late nights, but not early mornings. May 17 we woke up early and went to the Statue of Liberty. Because these girls are planners they were able to get us the crown tour. Which means we got to walk all the way to the top of Lady Liberty's crown. It was awesome. It was pouring down rain all morning and I wore my new rain boots that I purchased the night before. They were lined with some furry hot stuff that felt like it was growing into my skin. The steps are so tiny that my boots barely fit on just the toe. The tour really is made for cooler weather that is clear so you can see more, people with little feet, and people who are in good shape. By the time we all got up there we were ripping our coats off and there is barely room to even stand. But it was awesome being up there and I'm super glad we did it. We also toured Ellis Island and got a lot of history about immigrants and the process to enter the USA. We loved the history of both the islands and fell in love with the beautiful views, even if it was overcast. My favorite thing to do in big cities is walk everywhere. I feel like I can appreciate the architecture and take in the city much better than if I am driving. After our tour we walked around Wall Street, the New York Stock Exchange, the first Capitol building where George Washington helped create this amazing country, and shopping for diamonds at Tiffany's. That night we got to go see the Harry Potter Cursed Child play, the first act. The play was unbelievable. I cannot believe the special effects and how amazing the actors were. It really blew my mind. I have never seen a play like that before and I completely fell in love. I would go back to New York just to see that play again, it was incredible! The next morning, the 18, we went to breakfast and the food and decorations were amazing. I took pictures everywhere we went and the food did not disappoint. After we ate we went walking again around Washington Square Park, SOHO and Chelea Market. We ate at Los Tacos No. 1 for lunch and we were dying the food was so good. We could have shopped there for hours. We could not get enough of that place, it was so amazing. It's an old building and the details and design is everything I want in an old building. Old brick, exposed beams, you can see the old way the building was used previously but they renovated it to just the coolest space. I got my first ever Lavaine's bakery cookie and holy smokes!! If they had cookies like that here I would be 500 pounds. SOOO good! The second act of the play was this night so we rushed back to catch it. Again, amazing night full of the best memories ever. Stacia and Britni wanted to get autographs of the actors so we waited outside after the play and got a lot of them to sign our playbill. I like the signatures and talking to them. But I loved watching Stacia and Britni way more than I cared about the actors. They were cracking me up! The 19th we woke up and went to SoHo again, and had maybe the best breakfast food in the world. We had food that we didn't even know what it was, and it tasted incredible. We all ordered like three things. New York is not an early rising city. Even on a weekend the restaurants don't open for breakfast until 9 am. Crazy! Then we went to Little Italy on a food tour from someone that they knew in High School. He does these tours for a living and it was so cool. We went to five restaurants, got tons of history on the city, and ate great food at each place. This is the tour that I got the cologne for Caleb from this cute little barber shop in the city. Everything about the tour and the city was told to perfection by their friend who knew so much about the history and what makes it amazing. Then we did the 9/11 Memorial Tour. Our tour guide was an older man who was there when the terrorists struck and he told the story and details about what happened with some compassion and understanding that it brought us all back to exactly what happened. He was such a sweet man and knew every detail and added such touching experiences that I hope I never forget. On the 20th we woke up and went for a walk to the temple in New York. It's a temple and a ward building together. A very odd combination in small cities but it makes sense there. It was very cool to walk into a temple on Sunday and then hang a right instead of a left, and then we were in a ward building. We were able to take the sacrament and sing songs and Britni recognized someone from High School. 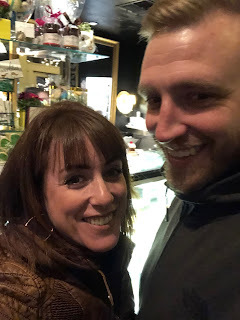 Then we went to Magnolia Bakery and had the famous banana pudding, it was so rich and way better than I ever thought it would be. 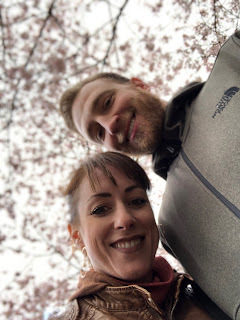 We walked around brownstone houses, up and down neighborhoods, went to Central Park and shopping on Saks Fifth Ave.
We laughed all day, laughed all night, ate as much food as possible, walked as much as I do at Disneyland, and had the best time. It really was one of my favorite vacations ever. We all wanted to do the same things and I had no idea we would travel so well together. Now we just need to talk our husbands into taking care of the kids so we can do it every year! This year the Easter holiday was also April Fools day and General Conference weekend for church. It turned out to be a fun and relaxing weekend for all of us. The kids woke up to treats from the Easter Bunny. 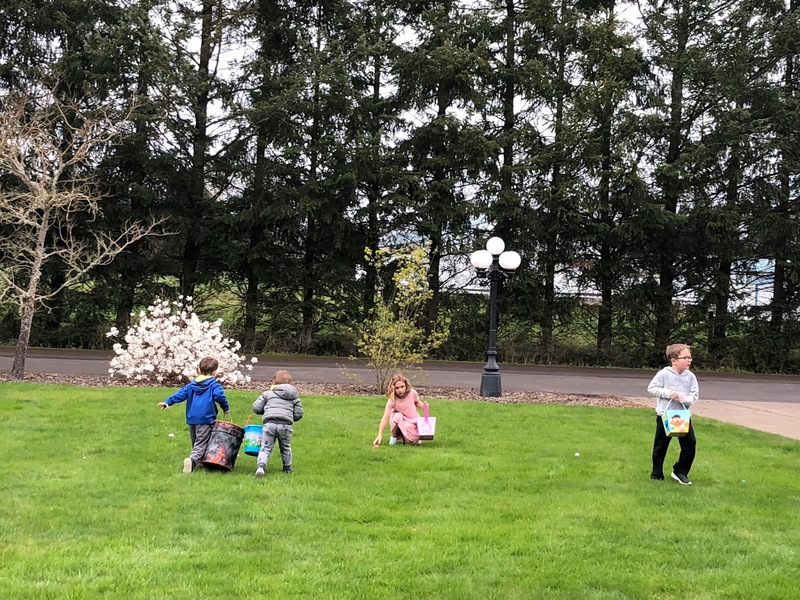 They ate candy for breakfast, and then helped me fill eggs with coins and candy to take to Granny and Papa's house later. 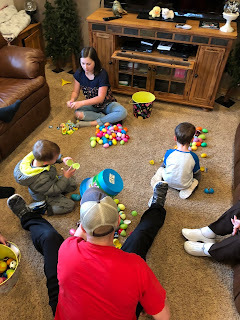 After conference was over, we went to my parents for the big egg hunt. We just missed the rain, which was perfect. 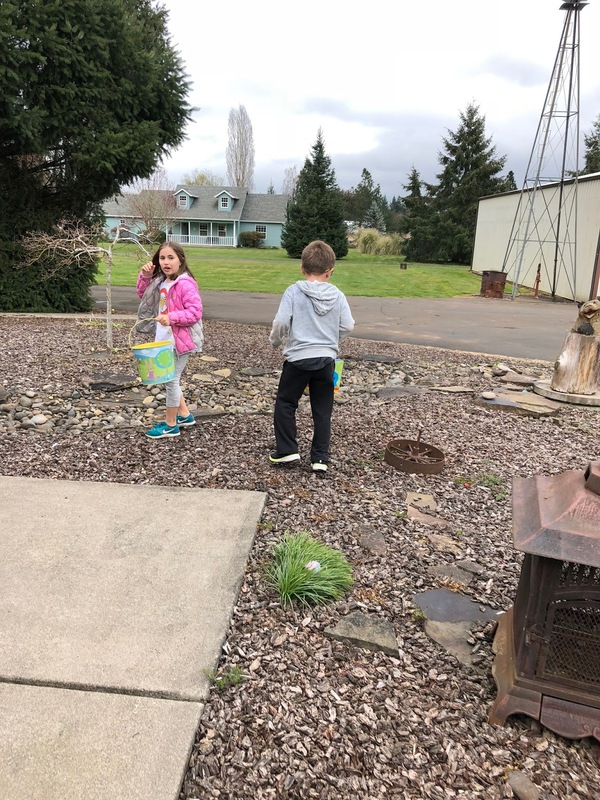 The kids ran around outside and got their eggs and money. This break I decided to kidnap Rhoda's youngest three girls, and cram my car to the rooftop with kids on our way to Utah. My kids were so excited to have extra cousins in the car for the ride. We left around 4 am, and they slept the first three hours because it was so dark and pouring down rain. I was the only driver, but it wasn't too bad since it's only 13 hours to Logan Utah where Caleb's sister Jenny lives. Rhoda's kids have not been there for years and every kid loves their house. They have tons of animals and the kids got to ride a pony, milk a cow, make butter, ride big horses, eat smores outside in the fire pit and play in the club house. It was so much fun! We went to my cousin Jocelyn's house for a couple of days and she kept us busy. Trampoline park, daily workouts, shopping, great food, and dance parties. We finished the trip back in Logan and then headed home. My kids are already asking when we get to go back again. Our schedules are so crazy right now that we almost didn't make plans for our anniversary. Then I thought about it more and decided that we NEED to get out of town and do something. So I booked us a hotel in the Pearl District, and I scheduled us each a 90 minute massage next to our hotel. 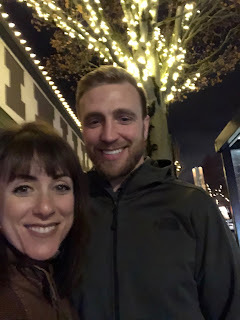 My mom is watching our kids and we went on a one-night getaway! We ate Thai food on NW 23rd, and then got dessert from Papa Haydn's and took it back to our hotel. Our hotel was really nice and had a great balcony on the top roof. We slept horribly at the hotel, but the dessert in bed was a big bonus. The next morning we stayed in bed, and had amazing massages! It was so relaxing and a great way to start the day. We went out for ice cream at Salt N' Straw, our favorite. Then we shopped all around Portland. Caleb even got a bunch of new clothes that were long overdue! We got home late on Saturday, went to 9 am church on Sunday. After church we volunteered at the Soup Kitchen downtown. Second year in a row we have done it and it's actually pretty rewarding and reminds me how blessed we are. This guy has been so busy working on his practice and turning it into his dream job. We spend a lot of late nights working and staying up late in bed talking about the plans. It was great to take the night off and spend time with friends eating some amazing steak at Ruth's Chris Steakhouse. They decorated the table form and even got him a card. The best part of the meal was their mac n cheese. It was amazing and I don't even like to eat that EVER! I absolutely love Christmas time. I love to wrap gifts and leave them under the tree for weeks up to Christmas. I love to take gifts to people and the excitement that only a child can have this time of year. We stay up WAY too late every Christmas Eve making sure we didn't forget anything. This year was a little over the top from Santa. It's always pretty obvious when I am involved in the shopping for the kids and when Caleb is left to run to the store. He has a tendency to go a little overboard. 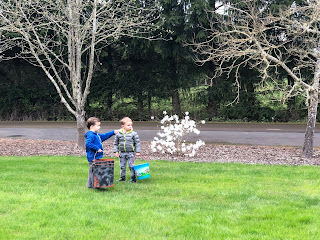 Anyway, the kids always pass the tree on the way to our bedroom so I always try and wake up before they do so we can all have the surprise together. This year I heard Calvin coming upstairs because he walks so loudly that it's hard to miss. 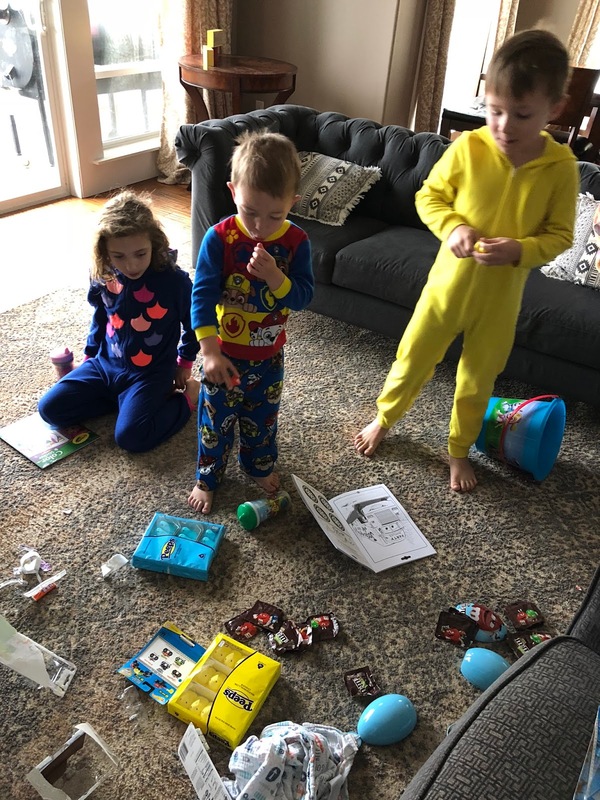 We waited for Shelby to wake up and then let the big kids open their Santa gift. And then Ronin came up and wanted nothing to do with his. Pretty funny, but he wakes up like Caleb, slow and cranky! After we shared gifts and breakfast we just played together and relaxed. Christmas evening we went to my sisters and got to talk to my nephew Logan who is serving a mission in Nicaragua. The call was relatively short, but we had a good connection and could see him clearly on the TV. He comes home this summer and we always love getting to hear missionary stories from him. Feeling blessed this Christmas for our beautiful family and healthy kids. It's challenging not to think about our baby we just lost. We won't ever forget him. The kids wanted to get him a stocking and still named a couple of decorations after him. So sweet. We love our little man Slater and can't wait to see him again. Finally scored some Seahawks gear!